What are Moon Rocks Cookies? Simply they’re the best cookies on the face of the Earth. Moon Rocks Gourmet Cookies have a very distinctive texture. They are a delightful surprise to the senses. They are not overly sweet and are artfully packed with 100% all natural gourmet flavors. 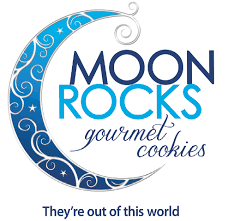 Moon Rocks Gourmet Cookies are made with the finest quality ingredients and each one is hand formed. Enjoy the perfect imperfections of our lumpy, little chunky Moon Rocks.